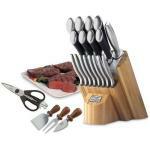 You may actually be more tempted by the extra deals Chicago Cutlery offers with this 18 piece Block Set than by the knives themselves. 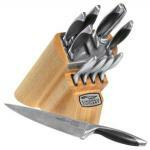 Eight prep knives, eight steak knives, a sharpening steel and a laminated bamboo block make up the primary package, but wait! There's more!